Use the comments form below to contact us at 'vegetable garden guide.com'. Tell us what you liked or disliked, or what needs to be improved so that your next visit is more enjoyable and informative. We are always open to new suggestions. The reason why we use a 'form' and not an email address is to keep both our email addresses safe from spammers. Those unscrupulous people use spam bots(robots) to trawl the internet sucking up all the email addresses they can find in order to send out their unsolicited emails. We prevent this by using the form below. Say hi! to Freddie frog. He enjoys hanging around inside the green house - we haven't seen a slug for ages. 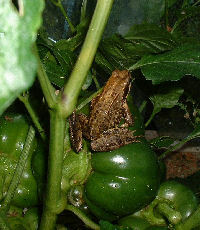 His pals hang around in the vegetable beds jumping out to startle Ros, my wife, when she picks the veg. questions via this form - sorry. it with anyone. I promise it will remain confidential.